The greenhouse has multi-functional purposes that could be used in different climatic conditions. It is designed to efficiently capture dew, fog, and rainwater depending on the area. The low tech greenhouse is made to serve communities who live in harsh climatic conditions and who face soil erosion and recurrent droughts. We are now focusing on the Ethiopian highlands where farmers rely on rainfall to irrigate their crops. Yet, rainfall in these areas remains scarce and uncertain every year. The greenhouse is an affordable technology that allows farmers to capture water and reserve it for irrigation throughout the year. Located in wetlands or next to the coast, the greenhouse is suitable to collect dew that forms on the plastic film when the temperature drops at night and is then collected by gutters. The water collected can then be used for irrigation and for safe drinking water. The materials are commonly found everywhere, but they could vary for more efficiency depending on what we can afford. For example, the polyethylene is cheaper but could harvest less dew than polycarbonate, and both could be insulated by using foam or straw so that dew appears in one side of the plastic but it will then block 50% of the light. In this case, the greenhouse serves as a nursery for the growth of trees or other perennial plant seedlings. If used without insulation, the system will capture dew on both sides of the sheet. There are two design options that could slightly vary, one for the high-altitude which will include a fog catcher and one for the low-altitudes that will focus on rain and dew collection. Our first project consists in training farming communities on how to build their own greenhouse. The training also comprises soil building and water management practices (composting, mulching, perennial planting) so that the water collected can be used in the most efficient way and can be stored in the soil for a longer period. During the training, we provide them the tools and materials needed for farming and for the construction of the greenhouse. Our general objective is to help farming communities to be more self-sufficient during the farming process and hence increase their economic and social conditions. The primary beneficiaries of this project are the women farmers who are the most disadvantaged people in the agricultural sector. Their income is very low and their land is usually much smaller than the average. The originality of this project lies in its ability to connect farmers with academics, agricultural experts and designers. We are all working together to achieve our goal which is to improve smallholder farmers’ general situation. 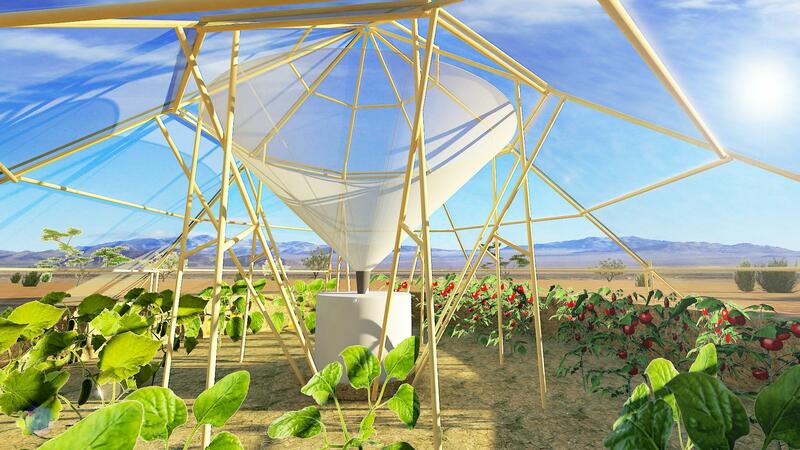 This effective teamwork fuels innovation and that is how the idea of a greenhouse combining crop production and water harvest could be developed. Easy-to-build and low-tech are the other essential points of this practice. One farming family can build their own greenhouse and can be helped by neighbours to build one for the whole community as we train them to make it and to take care of it in the long run. In this way, we can break down dependency of poor communities and build up their self-reliance. We are expecting that the smallholder farmers who will be part of this project will get actively involved in the fight against soil erosion and drought which remains a constant threat in the Ethiopian highlands. The training on soil building and water management practices to be implemented inside the greenhouse will give them the key tools to enhance soil health. As the greenhouse will serve as a nursery, farmers can tackle the issue of water runoff by planting deep-rooted trees. By planting native perennial trees, farmers will not only have another source of income but will also increase biodiversity on their lands. The greenhouse is suitable in different regional areas with diverse climatic conditions. It would be suitable for dry areas located next to the coast. In this case, we would implement the design of the greenhouse that focuses on dew collection. In the mountain regions, we would develop another design that focuses on fog catchment. As many parts of Eastern India are already familiar with dew collection, the greenhouse would be accepted more easily. Cost of realisation Each greenhouse costs from $500 to $600 depending on the location and the materials found. We are now developing a project that consists in building a training institute for farmers. The construction of the institute will be finished in late July (2015) and the greenhouse as well and will cost $2500 for the institute and $500 for the greenhouse. We will then start the trainings in late September (2015) so the amount of money expected to be spent is $5800 comprising the salaries for 4 instructors for 3 months ($200 per month), the purchase of seedlings ($400) and the construction of 6 greenhouses ($500). Each greenhouse will serve a farming community. We did not count the transportation costs as we are negotiating with the University of Gondar to cut this expense. Cost of implementation To implement this project in other regions of Ethiopia, the costs will be the same than in Gondar. If we want to build one greenhouse for one community, it would cost a total of $960 comprising the materials and the cost of trainings. In other parts of the world, the costs depend on the average salary and the availability of the materials. For example, in India, the average salary is higher but the materials to build the greenhouse are cheaper. Financial aid (expected contribution) Our ongoing project has been partially funded through a crowdfunding campaign. In order to complete the trainings successfully, we will start a fundraising in August (2015) to reach the sum of $3000 that will allow us to organize the trainings until the end of January (2016). Meanwhile, we are gathering investors interested in our project to fund an application game that could be available on the apple store and on android, its costs is $50.000. Educational and entertaining, this game will introduce the players to the world of natural enemies to protect your crops against pests invasion. This app will be a way to connect virtual life to reality since the profits generated will contribute to implement our project on a larger scale.